Harry Potter film producer David Heyman has been conducting interviews in conjunction with the release of his newest film “The Boy in the Striped Pajamas” which stars actor David Thewlis (Remus Lupin). 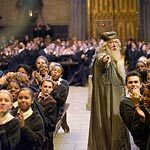 Along with many other Harry Potter fan sites, we here at the Leaky Cauldron were able to speak to Mr. Heyman, who answered this editor’s questions regarding the recent move of “Half-Blood Prince” to next year, as well as give us an update on the elimination of beloved characters from movie six, their return for movie seven. Importantly, Mr. Heyman discusses why two “Deathly Hallows” films were good for keeping in the subplot on The Deathly Hallows, and gives us an update on the progress on the scripts for “Deathly Hallows” part one and two. You can read the entire interview below. DAVID HEYMAN: The fact is that my passion and that of everybody who works on the film is undiminished. It is called ˜the film business’ and the reason why Warner Bros moved the date was for business reasons. Because of the writer’s strike and other factors in Hollywood there was not the pipeline of material for next year that they needed. They had a very big year with The Dark Knight and they needed a big film for 2009 and Harry Potter filled that slot. I appreciate the disappointment, I really do. As a film maker it is always nice to finish a film and move on to the next. But I think that the film will not be hurt by this experience at all. The studio has always been, and remains, committed to the film in every way. If the film had come out in November this year, there would have been a two year wait for the first part of Harry Potter And The Deathly Hallows. What now will happen is that there will be a two year gap between Order Of The Phoenix and The Half Blood Prince and there will only be, in ball park terms, a 16 month gap between Half Blood Prince and the first part of The Deathly Hallows. The Deathly Hallows is coming out in exactly the same schedule as was originally planned and we are starting principal photography in February as planned. So nothing has changed with the other films. As opposed to there being a two year gap between Five and Six, there will now be a two year gap between Six and Seven. TLC. After the move of HBP to next year, we were uncertain if you were still going to do those test screenings, and I think its safe to say we were all thrilled with those reports from the first screenings-I know I can’t wait to see the movie! However, given there has to be cuts in beloved characters such as the House Elves, can you tell us if these things will impact the development of movie seven and eight (ie events at Gringotts/Grimmauld place and we love Dobby!). DAVID HEYMAN: Inevitably there will be certain things that we will probably have to introduce and emphasise in the Seventh film. Before we read the Seventh book there had been things in the earlier films that we had not realized how important they were. There was an example in the Fifth film when we were considering cutting Kreature but Jo [Rowling] said to me¦”I wouldn’t do that if I were you’¦She didn’t tell us why, but she said we would be advised to keep him. And of course in the Seventh book Kreacher is an important character. It has been a while, for example, since we have seen Dobby and I suspect we are going to have to make more of Dobby in Seven than we might have done. I think we have done a pretty good job of what we need in terms of the plot. TLC.How are we doing on the scripts for both the DH films btw? QUESTION: How hard was it to find Asa Butterfield and Jack Scanlon to play the children Bruno and Shmuel in The Boy In The Striped Pyjamas? DAVID HEYMAN: It was quite hard. We had the fantastic Pippa Hall whose specialty is child actors and she found the boy who played Billy Elliott. I have known Pippa since I was a child. We had approached Leo Davis to do the casting and Leo brought on Pippa. She scoured and scoured the country. It was a fine balance because you wanted the children to possess the essence of the characters because however their imagination you are very often working with the innate essence of a child. So Pippa showed us hundreds upon hundreds of tapes of children, most of whom had very little experience. When it came down to it, our Bruno had no film experience at all. In a way part of the innocence of Asa Butterfield served us well because he was not particularly knowledgeable about the Holocaust, he wasn’t particularly experienced in film making. He became a little bit more knowledgeable of both through the process of making The Boy In The Striped Pyjamas and I think that the gradual increased awareness of both the Holocaust and the film making experience fed into the journey that the character goes through in the film. Thanks much to John Millar and Krzys! “We suspect that there will be a premiere in New York and one in London. ” He also confirmed the reason behind cutting the battle at the end of the HBP was indeed due to the big battle that happens at the end of Deathly Hallows. Update 3: From the HarryPotterspage interview, we hear more on what Mr. Heyman’s plans are post-Potter:I am both excited and frankly a little saddened by the end of the series growing closer. Working on Harry Potter has been the gift of all gifts. It has changed my life in every which way. Every day working on it, I promise you, has been an absolute pleasure and something that will never be repeated. I am sure that when the time comes it will be a very sad day. I work with certain groups of people every day and I will not be doing that in the same way in the future. I will also be very proud because I am very proud of the films and very proud of the body of work that I have been a part of. At the same time I will be very excited about the new challenges that lie ahead. I am working on a book called The Curious Incident Of The Dog In The Night Time which I look forward to working with Steve Kloves who has written the Harry Potter films and who will write and direct that. Even now I am working on Paddington Bear and some other more adult films. I also made a few other films while I was producing Harry Potter so I am looking forward to having a little more time to work on those things. But Harry Potter will always be a part of me and what an amazing journey it has been.